Fr. 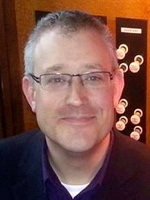 Simon Lumby SSC is an unusual individual in that he had an established career as superb tenor soloist, organist and conductor before being ordained. A luminary in Leicester’s musical world and incumbent at Saint Aidan’s Church in Leicester he will take us on a fascinating musical journey with recordings reflecting his multi-faceted career. This was a hugely enjoyable evening from a remarkable man of many parts: organist, pianist, singer, choral director, cello player and Anglo-Catholic priest. Fr. Simon Lumby’s talk was largely autobiographical and included many fascinating diversions and asides about both music and the church. It’s clear that the young Simon was something a prodigy and was a born performer, singing treble solos in his local choir, playing the piano (almost before he could read); being coached at the age of ten by the renowned organist Dr. George Thalben Ball and, some years later, winning an important international organ competition. He went on to a successful professional career in music. Later he took Holy Orders and since 2006 has served as the parish priest at St. Aidan’s in New Parks. Not surprisingly, the heart of his talk was music as an essential part of his faith. He illustrated this with some splendid recordings – not least of his own performances. We heard him as a young soloist in Stanford’s Magnificat in B flat and other highlights included Dame Janet Baker singing the Angel’s Farewell from the Dream of Gerontius; Marie-Claire Alain playing Litanies by Jehan Alain and tenor James Gilchrist in The Salutation from Gerald Finzi’s sublime Dies Natalis. The evening ended with another of Fr. 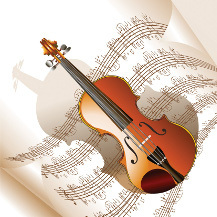 Simon’s own performances, the simple yet moving song, A Grateful Heart by Mary Plumstead. You can learn more about Simon's musical life on his music site, where you can also hear (and see!) him playing the organ, as well as buy his CDs (proceeds to Saint Aidan's Hall Renovation Appeal).